Sculptor Of Wall Street Bull Says 'Fearless Girl' Horns In On His Work : The Two-Way Arturo Di Modica is not happy that the Fearless Girl now staring down his Charging Bull has effectively turned it into a villain. He and his lawyer are now asking that the new statue be removed. 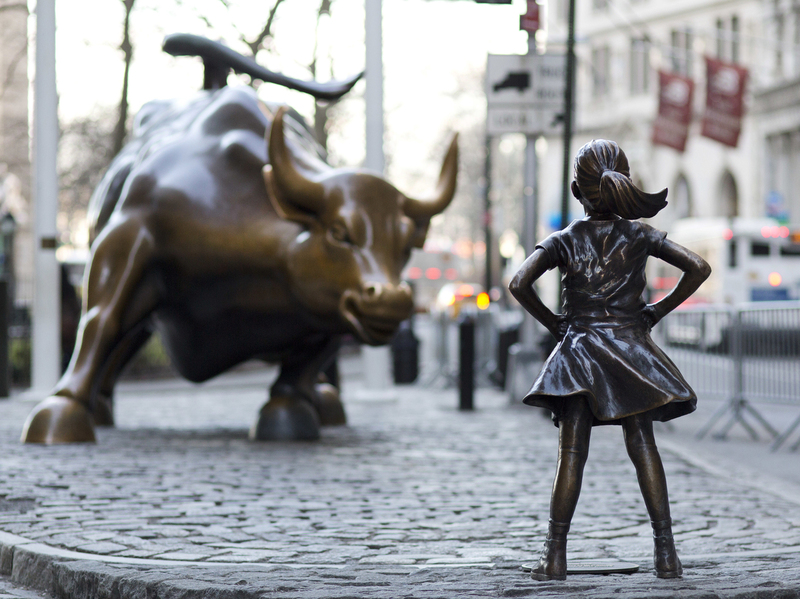 The Charging Bull and Fearless Girl square off in New York City's financial district. 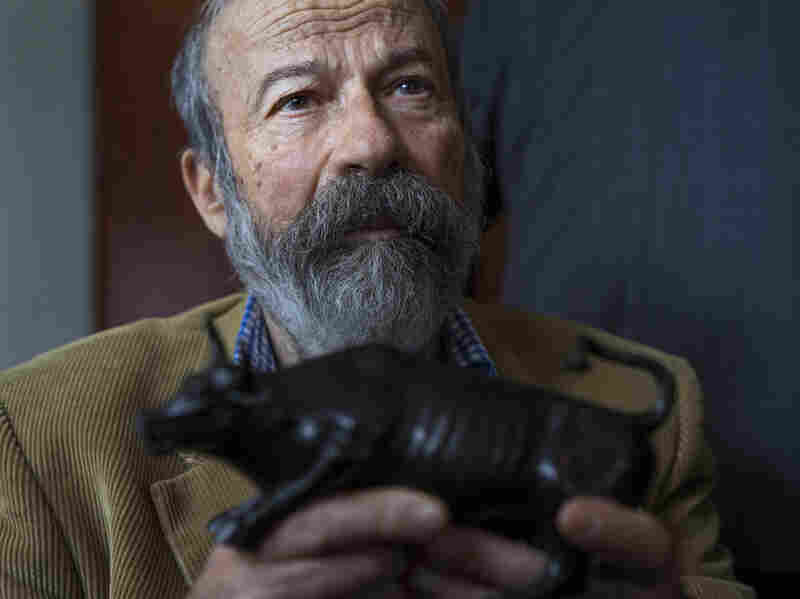 Arturo Di Modica, the bull's sculptor, says the girl staring it down has changed the meaning of his work in an unwelcome way. So far in her young life, New York City's Fearless Girl has drawn countless tourists, a metric ton of media coverage and its fair share of praise as a symbol of the fight for gender equity — so much, in fact, that the statue staring down the financial district's famous Charging Bull recently got a new lease on life, at least through 2018. For at least one person, though, the Girl has offered less than welcome company. "The girl is standing there like this in front the bull, saying, 'Now, what are you going to do?' " the bull's sculptor, Arturo Di Modica, said at a news conference Wednesday, according to CNN. Arturo Di Modica holds a model of his Charging Bull during a news conference Wednesday. He maintains that Fearless Girl — sculpted by Kristen Visbal and commissioned by the firm State Street Global Advisors, which intends to call attention to a lack of women leaders on Wall Street — at once distorts the intent of his statue from "a symbol of prosperity and for strength" into a villain, and does so for the firm's own commercial gain. He put a finer point on the matter in a March interview with the New York Post and MarketWatch: "That is not a symbol! That's an advertising trick." And he's prepared to fight for its removal. "There are issues of copyright and trademark that needed to be — and still need to be — addressed," Di Modica's attorney, Norman Siegel, said at the news conference. Siegel, a longtime civil liberties lawyer, carefully emphasized that they, too, support the fight for gender equality and that they do not want the Fearless Girl banned entirely. "Remove her and place her somewhere else in the city," he said. "We've got lots of ideas. And damages must be awarded to Arturo for violation of his legal, statutory rights." Siegel said a lawsuit has not been filed, but left the door open to the possibility, according to The Guardian. The statue at the heart of the dispute went up last month in celebration of International Women's Day, and though MarketWatch notes its temporary permit originally lasted only until April 2, the city renewed that permit through 2018. But Visbal has made no secret of her admiration for her statue's massive counterpart: "The bull is beautiful," she told The New York Post in March. "It's a stunning piece of art." Even the method of the statue's installation — dropped unheralded in its spot overnight — paid homage to the bull it confronts. Di Modica himself plopped his 3 1/2-ton bovine beneath a Christmas tree in front of the New York Stock Exchange in December 1989 without a permit. The Italian immigrant intended the work to bolster American traders' spirits after the stock crash of a few years before — though the NYSE, it must be said, was not pleased with its holiday gift, hefting away the bull by the end of the day. The Charging Bull eventually found a home two blocks away, at its current resting place just south of Wall Street. New York City Mayor Bill de Blasio has shown no inclination of moving the intrepid girl from the bronze bull's path any time soon: "Men who don't like women taking up space are exactly why we need the Fearless Girl," he tweeted Wednesday morning. Visbal, at least, feels some sympathy for Di Modica — "poor Arturo," she told the Post — but she, like her statue, doesn't appear ready to back down either. "The world changes and we are now running with this bull."